PBX (Private Branch Exchange) is useful when you need to make relationships between individual telephone numbers or among multiple phones. Traditionally, PBX is used in office settings to give employees their extension numbers and voicemail boxes. Establish relations among multiple phones (e.g., extensions, ring groups, etc.). Share phone lines among multiple phones. Use many popular call features, such as Voicemail, Caller-ID, Call Transfer, Call Forwarding, Auto Attendant and more. The difference between traditional PBX and IP-PBX involves the type of network that will be using the PBX. Using traditional PBX, voice and sound travel on a traditional telephone network over analog telephone wires, often referred to as POTS (Plain Old Telephone Service). Using IP-PBX, voice and sound travel over IP networks. Why should you choose IP-PBX? One popular reason to choose IP-IBX is to have more fun with communications. If you're like me and enjoy using the latest technology, you have probably already tried Skype or Google Voice. 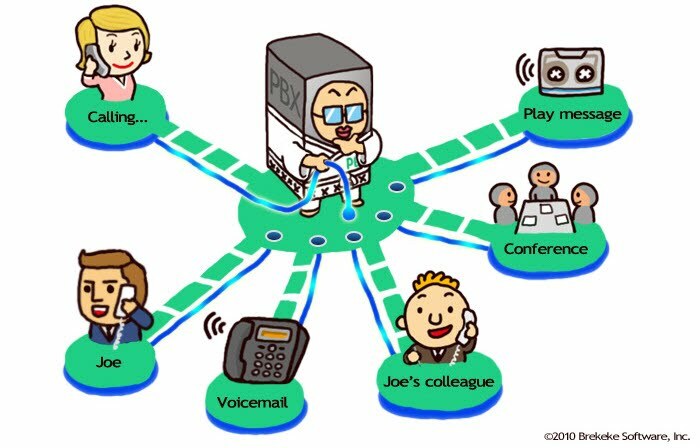 Since SIP is THE protocol for VoIP, everyone including Skype and Google Voice will be connected with SIP in the near future. When that happens, your office's PBX system will be ready to enjoy all of the many available free IP services, not just the ones that cost money. But in addition to the fun side of IP-PBX, there are also many practical reasons to choose this service, including a better ROI (return on investment) and increased communication efficiency. Combines voice lines and data lines into one, so there's no need to sign up for a separate telephone line. High scalability – Adding extensions and new lines is a snap. Easy configuration – Users can configure their own settings without any help from a system administrator. Provides convenient software integrations: Outlook integration, CRM integration, Unified Communication, and more. Ready for a Test Run IP-PBX? Subpages (3): > Call Forwarding > Call Hunting > What is IVR?